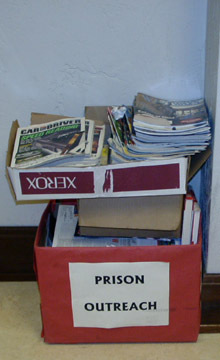 Since its establishment in 1982, the Bunche Center Prison Outreach program has provided books and other reading materials to prisoners housed in the nation’s penal institutions. CAAS fulfills requests from institutions ranging from the California Rehabilitation Center in Norco, California, to the Connecticut Correctional Institution in Somers, Connecticut. Early on, the donated materials consisted primarily of newsletters, books, magazines and newspapers from the CAAS Publications unit and the Bunche Center Library and Media Center. The current outreach program has successfully solicited books and magazines from the UCLA community and off-campus communities. If you are interested in donating books or magazines, please bring them to the Center (160 Haines Hall) or call our main office listed below for additional information.